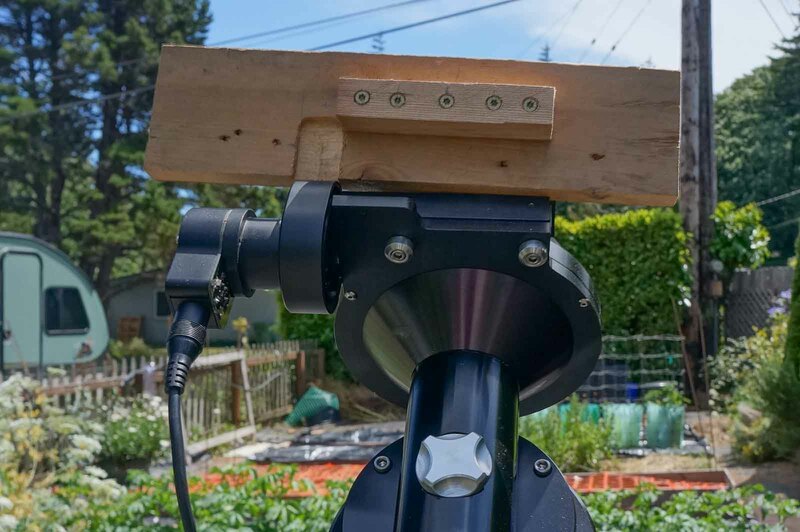 As a step toward having another observatory, I’ve installed the equatorial head of my Losmandy G-11 mount on a steel pier. This pier, composed of heavy 4-inch diameter galvanized steel pipe, had formerly carried my Celestron-8 at a previous observatory. The pier with equatorial wedge is shown below at a former residence during construction some 35 years ago. It is seated in about 800 lbs. (360 kg.) of concrete. I removed this entire mass and reinstalled the pier at two different places I moved to in the course of several years. But now it has reached its final resting place on the Oregon coast. The top of the pipe has an 8-inch diameter cast-iron flange used as an attachment point for the equatorial mounts. 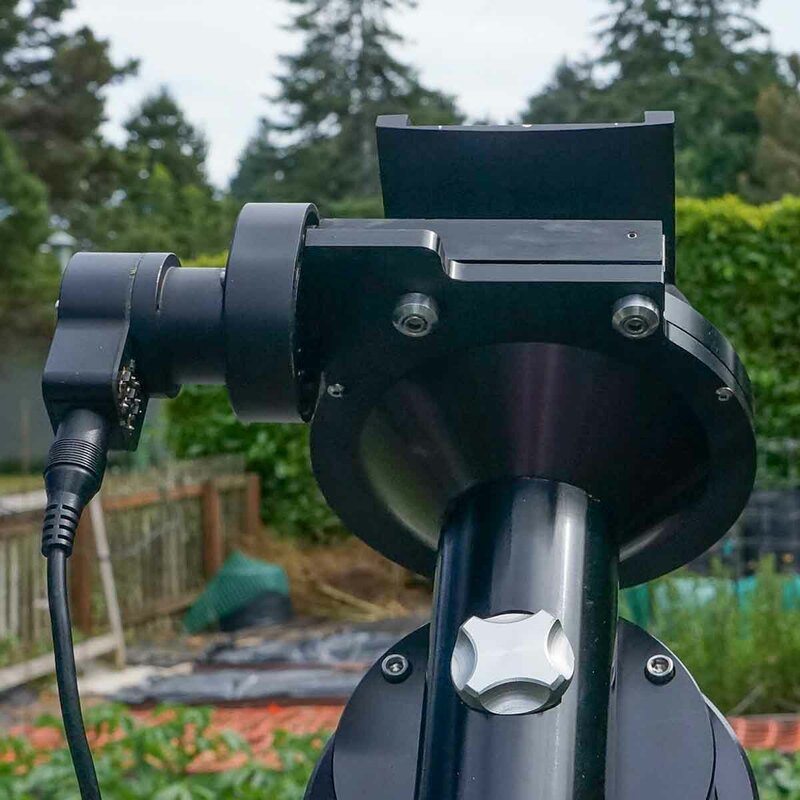 A standard Losmandy pier adapter allows for a solid connection between the G-11 equatorial head and pier. Since I wanted to keep the mount attached and polar aligned, there was need to cover the mount when not in use. For that I pressed into service a plastic garbage container that had been used to hold noxious weeds for disposal with other garbage. A quick cleanup with hose and scrub brush made for a nice, water tight cap. The cap is held down by some parachute cord to keep it in place during frequent strong winds at my location on the Pacific coast. The photo also shows the electrical outlet at the base of the pier, fed by an underground wire. Also visible is a shelf for the power supply. This was constructed from some aluminum C-channel that had seen previous service as a log truck bumper. I had to arrange for supporting the cap so that it didn’t rest on or lean against any vulnerable parts of the mount - servo-motors, electrical cables, etc. So a couple of wooden braces were constructed from scrap wood to protect vulnerable parts. Some of these can be seen in the following photo. All mount parts except counterweight and CW shaft can be covered by the cap. 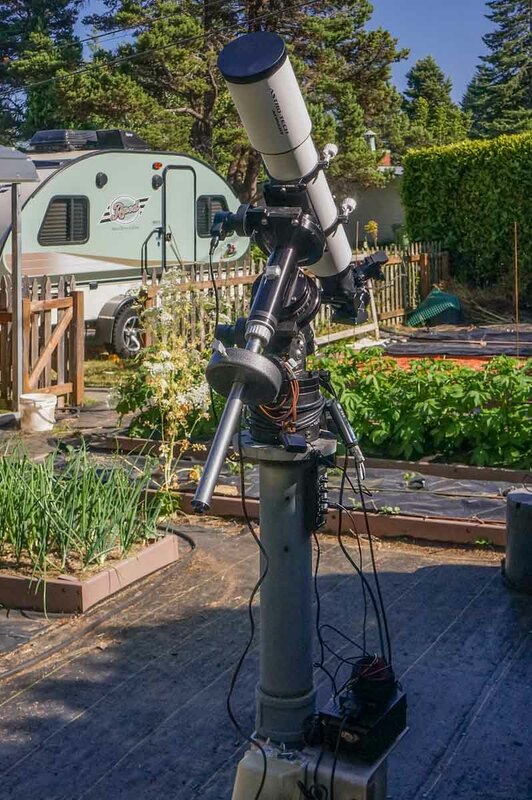 Total time to set up is less than 5 minutes, including bringing the telescope out from the house, installing counterweight/shaft and connecting all electrical components. The latter includes power supplies, dew heaters and SkyFi wireless control module for use with SkySafari. The following photo shows how everything is stowed before the cap is lowered over it all. Below the power supply is the Gemini-1 electronics chassis. On the left can be seen a controller for the dew heaters along with the little SkyFi wireless control module. Wrapped around the board on left is a dew heater strip. Last night I used the Gemini-1 electronics package to do a very accurate polar alignment using the Polar Alignment Assist routine. With just 3 iterations of the sequence, alignment was adjusted to be within 3 arc-seconds in both azimuth and elevation. While such accuracy is not needed for go-to operations, it’s good to get it as close as possible should I ever do long exposure astrophotography from home. 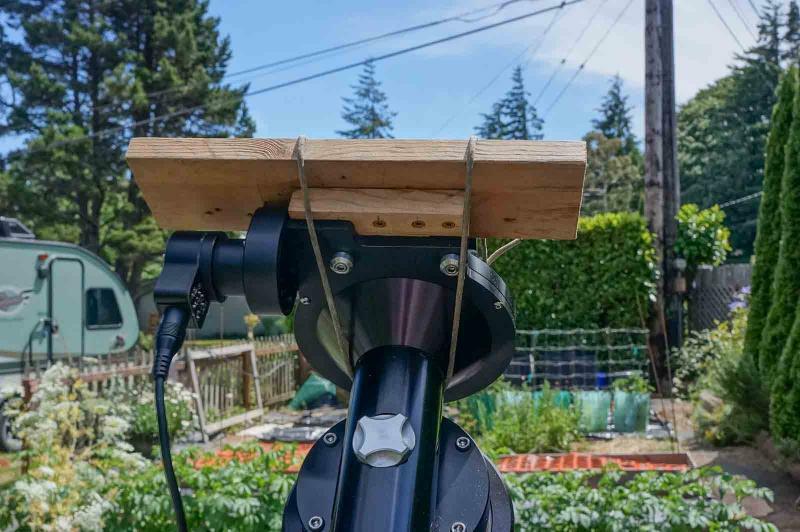 One advantage to also doing an accurate go-to alignment is that the telescope can be powered down in the counterweight-down, home position. The next time the telescope is powered up with a Warm Restart, pointing at a single alignment star preserves the pointing model developed from prior star alignments. The model can be further refined by subsequent star alignments. The above photo shows the mount all set up, carrying my little Astro Tech AT115EDT APO triplet. I was a bit concerned that the 4-inch steel pipe would not be stiff enough for use as a pier. But I’ve noticed no vibration with either a Celestron-8 or the refractor installed. To carry my C-11 will increase the load by another 20 lbs. (9 kg.). I expect it will be up to that task as well. During the “wet season” I’ll cover the mount and accessories with a Telegizmo cover wrapped tightly around the pier, with the plastic cap over that. I read somewhere on Cloudy Nights that a small incandescent light providing some heat inside will help keep the moisture levels down. Edited by Rustler46, 27 June 2018 - 01:46 AM. I suggest you find a way to seal the bottom of the trash can or you are going to have a nice crop of insects and spiders colonizing your high-rise in the sky. And just remember most spider silk is conductive. Better would be a clamshell cover with gaskets. I had to arrange for supporting the cap so that it didn’t rest on or lean against any vulnerable parts of the mount, such as servo-motors, electrical cables, etc. So a couple of wooden braces were constructed from scrap wood to protect vulnerable parts. My wood working skills are somewhat primitive. But what was constructed seems to support the cap and protect parts of the mount. The following shows the topmost parts of the mount upon which the cap would rest. The declination servo-motor and gear case is on the left. Next photo shows the wooden plate constructed to support the cap and protect the servo-motor. I routed out some relief for the servo-motor gear box as shown. The next shot shows the protective plate in place, supported by the declination shaft housing and the cover over the declination worm-gear. To prevent the cap from flapping around in the wind and protect other parts of the mount, it was necessary to make some other wooden parts as seen below. On the right is the wooden piece for the top of the mount. The two-forked wooden contraption on the left provides lateral support for the lower section of the cap, while protecting cables plugged in to the Gemini electronics chassis (power cord and servo-motor cables). The 3rd light colored wooden piece serves as a platform for the power supply in the stowed position. 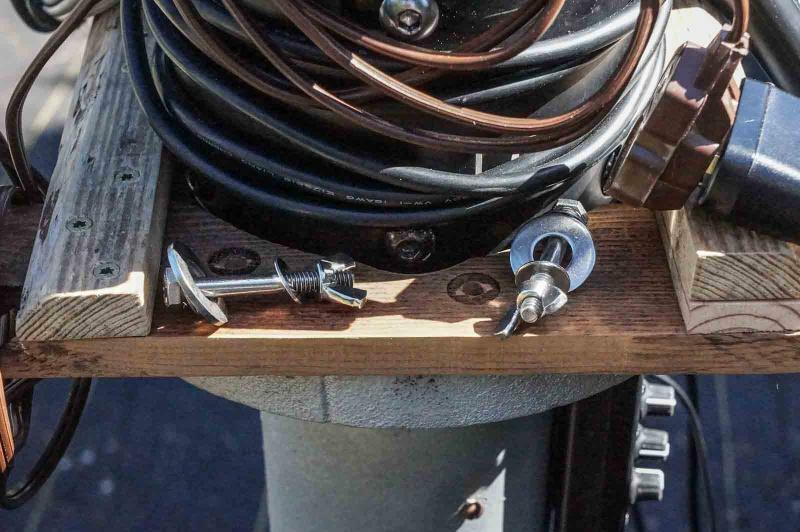 Next photo shows how one of these wooden pieces is secured to the 8-inch flange under the equatorial head. On the right can be seen where I added a spacer under that side of the wooden fork. This was necessary so that it would clear the control paddle cable attached to the right side of the Gemini electronics chassis. The whole assembly is a Rube-Goldberg type of arrangement. But it fits in with my construction skills, available materials and does the job. I save all sorts of small scrap wood. Often such a piece is just what is needed for a project. Wood is just too expensive and precious to waste. Edited by Rustler46, 27 June 2018 - 06:50 PM. My wood working skills are somewhat primitive. But what was constructed seems to support the cap and protect parts of the mount. The following photo shows all electronics and cables stowed so that the cap can be installed. The power supply sits on the little wooden platform. The control paddle, various cords and cables are secured between the power supply and the polar axle. 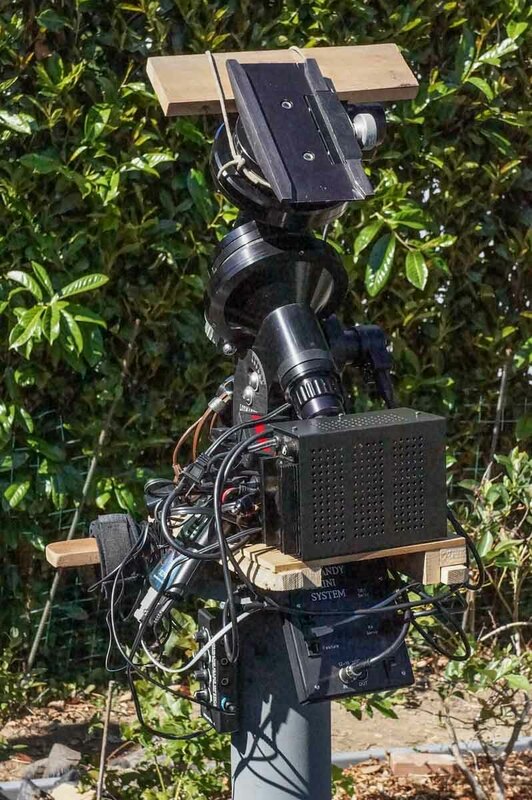 This whole setup should greatly reduce the amount of time and hassle it takes to set up for observing at home. An added benefit is the mount is very accurately polar-aligned and aligned for go-to operations. Thanks - I appreciate your input. That's a good point to remember about insects. They seem to be everywhere. I don't know of any inexpensive "clamshell cover with gaskets". But I'm open to suggestions for a practical way to implement your suggestion. Now that I seem to have gotten the mechanical solution to covering the mount, I'll give attention to how various insects can be excluded. 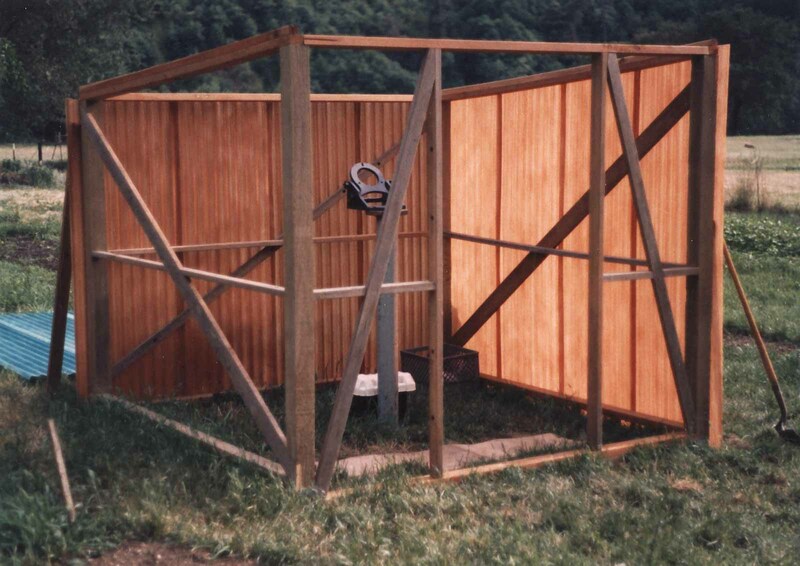 One thing I did before in my previous observatory was to hang a couple of no-pest strips inside to deter insects. Another option, particularly in the wet season is to cover the mount with a blanket followed by a Telegizmo cover and then the plastic cap. The Telegizmo cover can be tightly secured around the pier to prevent entry of insects and moisture. A small incandescent light and some silica-gel packs under the covers can help with moisture. I have placed a small 5 watt LED light bulb inside the pier adapter for the G-11 mount to keep a slightly elevated temperature inside. It is hoped that this will help prevent condensation of moisture on the mount during storage. The photo below shows how this was wired with the power feed coming up inside the 4-inch steel pier. This is attached to a 110 volt weatherproof electrical box secured to the base of the pier. 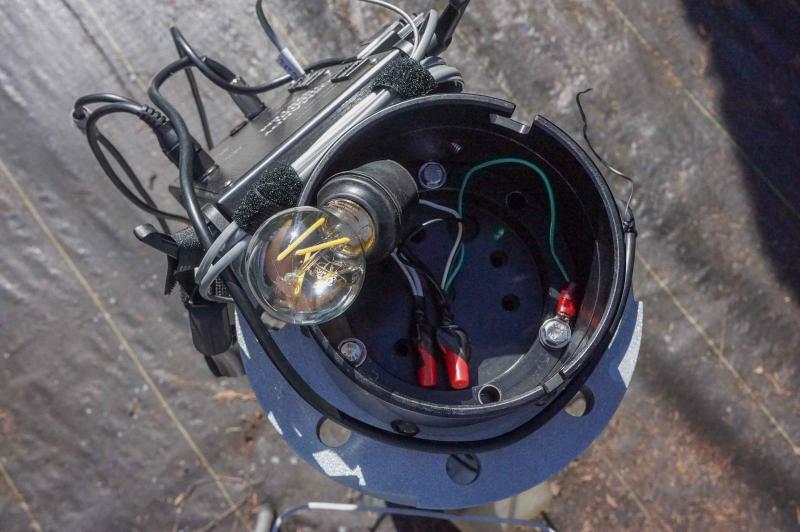 The photo below shows this light bulb in place before the G-11 mount was secured to the adapter. A small cup with moisture absorbing silica-gel crystals is placed inside next to the mount parts. This will be periodically checked and replaced as it does its job absorbing moisture. 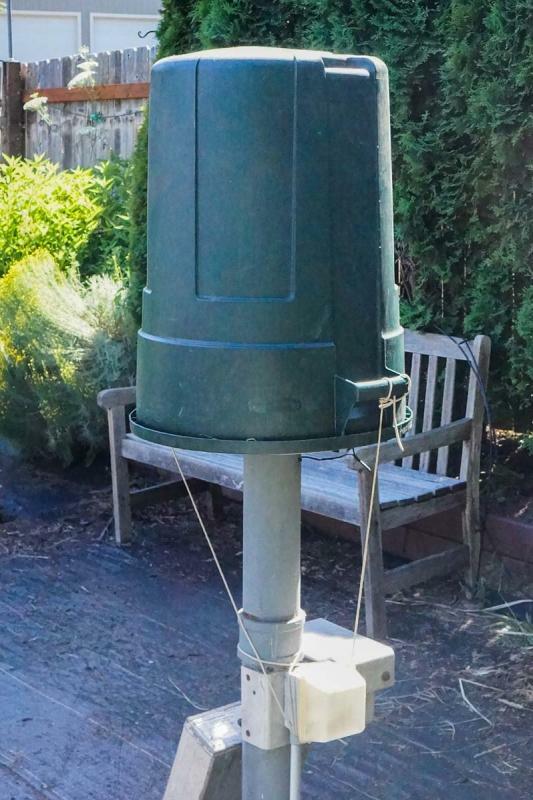 Before placing the plastic cover (AKA garbage can) over the stowed mount, I cover the entire thing with a Telegizmo telescope cover. The elastic draw string is cinched up tight around the metal pier to exclude most insects and moisture. The view is looking down vertically inside the mount's pier adapter. The large cast iron flange at the top of the 4-inch steel pier can be seen holding the adapter. The G-11 mount is installed atop this arrangement. Edited by Rustler46, 13 December 2018 - 01:48 AM. I believe that most people are using an incandescent bulb not an LED bulb. The incandescent is going to produce enough heat to control humidity. Does the LED light you have produce enough heat? I couldn't find an incandescent bulb with a wattage low enough for my purposes. But the LED light consumes 5 watts of electrical power, the majority of that being converted into light energy. My thinking is that the light being trapped inside the enclosed pier adapter will eventually get converted to heat and serve my purposes. The bulb feels warm to the touch when turned on. Edited by Rustler46, 13 December 2018 - 08:57 PM. Nice Rpod by the way! I was thinking "how does he know we have an RPod"? But I see it in the background in the photo, next to my garden observing site. It's just right for towing with a Toyota RAV4. My wife and I find the RPod 171 quite suitable for our camping trips. We just have to be willing to share the standing space, since it does not have the slide out feature. I use it when at the Golden State Star Party. It runs on solar power and propane when at that location. The permanent pier solution seems to be working out quite well. The light-bulb heat source and calcium chloride moisture remover seem to be keeping low humidity levels under the covers. This is despite the rather rainy weather at my location on the Oregon coast. Here are some photos showing the Losmandy G-11 mount with the little AT115EDT refractor atop either the C-8 or C-11. 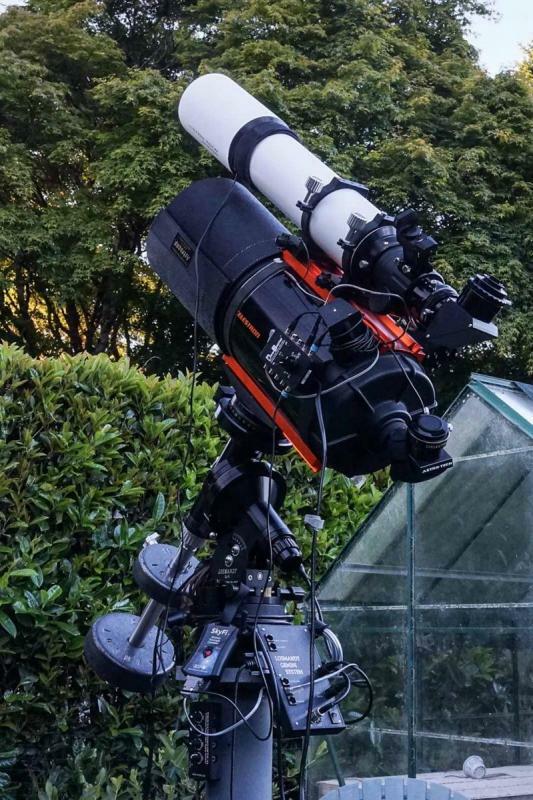 The Celestron-8 with 4-1/2 inch refractor atop seems to be easily handled by the G-11 mount, needing only the 21- and 11-pound counterweights. The Celestron-11 with 4-1/2 inch refractor atop is beginning to approach the G-11 mount's capacity. For visual use it works fine. But it does require a lot of counterweight, including both Losmandy 21- and 11-pound weights plus some extras. This includes an old '56 Ford V-8 engine front pulley (shown above) and a trailer tow ball/draw-bar (hanging by a nylon cord). 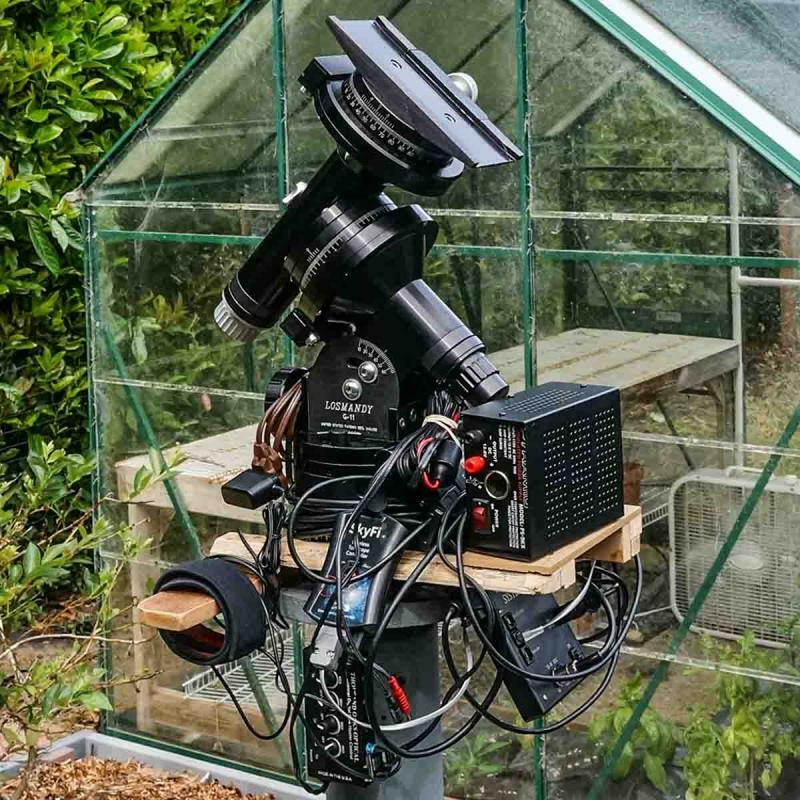 The whole arrangement provides go-to functionality for my SCTs and refractor. 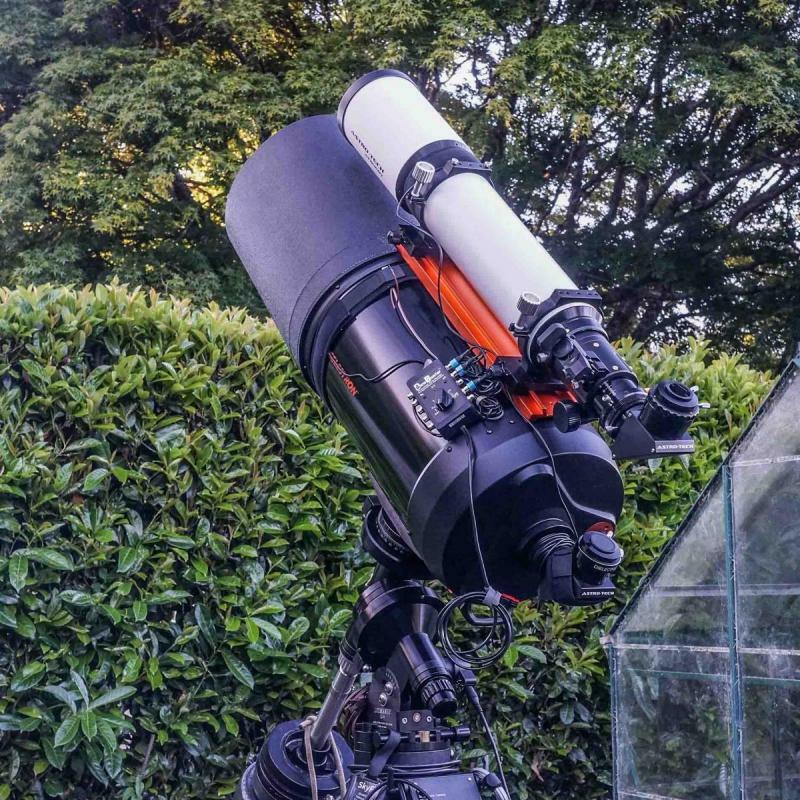 I am planning on remounting my 10-inch Newtonian on its original Dob mount. This telescope (a Hardin Optical DSH-10, my 30-dollar telescope) is sometimes carried on the G-11 mount. But I'm hoping the Dob mount is a little more grab-n-go compared to the G-11 permanent pier setup. While this isn't go-to, it does have push-to capabilities with its digital setting circles. Setting up will be just a matter of using a hand truck to wheel out the DSH-10 to the observing pad. This can be then set atop my plywood tripod to bring the eyepiece up to a more comfortable viewing level. The only drawback is that I won't have my new refractor along for the ride. There are always plus and minus considerations with any setup.